Find out what could explain your ankle pain. When your podiatrist or doctor suggests you may have Posterior Impingement Syndrome, then this relates to ankle pain caused by the soft tissue pressing up against the bone. If you experience pain at the back of your ankle, it can be caused by a specific activity in your daily life; whether it’s sports, or overuse from just a day-to-day routine activity. First will look at the causes of your heel pain, and if there is any inflammation. Our first focus as podiatrists is always to get you out of pain first, so we can then work on a healing process that ensures it does not occur again. To look at your foot mechanics in more detail, we use our bio-mechanical assessment here at The Foot Clinic. In this case, and sometimes combined with X-Rays, it may give us extra information about the exact cause of your Posterior Impingement Syndrome. 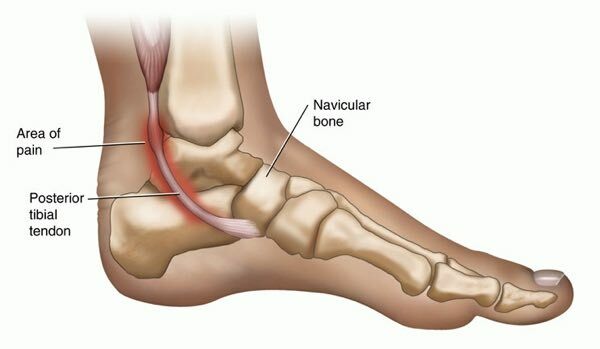 The syndrome may be caused by – believe it or not – an extra bone in the back of your ankle. We normally have 26 bones in our foot. Some of us were given an extra bone at birth, or sometimes the extra bone, at the back of our ankle, is there because of a previous trauma. Sometimes the extra bone stays unnoticed when there are no pain symptoms. But in the case of Posterior Impingement Syndrome, it may well be this 27th bone in your foot that is causing the heel pain. An X-ray will show your podiatrist if that is the case. Another cause of Posterior Impingement Syndrome could be that the structure of your ankle complex has changed over time. Professional dancers or athletes, who subject their ankles to a pressure that is higher than the average, may be at risk of the syndrome. Whatever the cause, our experienced podiatrists always start from an assessment, to then discuss the most suitable and most effective treatment options with you. Other than getting you out of pain and reducing any inflammation you may experience, the goal is to get you back on track, reduce discomfort and make sure that we can avoid excessive pressure on other joints in other areas your body. The fascial lines in our bodies connect “head to toe”, or in other words, all the joints, bones and muscles are interconnected. When one area is out of balance, it affects our posture, the pressure we put on our other joints and muscles, and this is why it takes a professional podiatry assessment to look at the bigger picture. If the symptoms of Posterior Impingement Syndrome are linked to the tightness of your calf muscle, then your podiatrist at The Foot Clinic Cottesloe might suggest dry needling as a treatment technique. Dry needling helps relax specific muscles, and once the tension in your calf muscle has been released, we may recommend FMT: mobilisations of your foot and ankle. It helps us reset the bone in the right position, and all this takes pressure away from your posterior ankle. Although we integrate experience from our extensive work with top athletes, we remain your trusted Perth family podiatry clinic for the Claremont, Fremantle and Cottesloe area. A podiatrist at The Foot Clinic not only excels in medical skills. We also pride ourselves in looking at you as a human being in the first place, not just at the symptom. We believe in building better and stronger bodies from the feet up, and we love what we’re doing. At Perth’s Foot Clinic, you can count on us for skin & nail treatments, diabetic foot care, as well as posture and balance strengthening. If your activities require ongoing follow-up, we offer integrated exercise programs to strengthen the muscles of your feet and lower legs. If you suffer from sports injuries, our PowerPlate treatment helps the natural healing process of your body so you can return to your sports sooner. Whatever the type of care your feet need, we’re here for you at The Foot Clinic in Cottesloe, conveniently located between Fremantle and Claremont.